ANKARA — A renewed wave of ethnic-based violence in Turkey has killed over 100 security officials, scores of civilians and (presumably) more than 1,000 Kurdish militants since July 20 when a radical Islamist suicide bomber killed 33 pro-Kurdish activists in a small Turkish town on the Syrian border. Worse, the clashes between the Turkish security forces and Kurdistan Workers' Party (PKK) has triggered a wave of street violence signaling ethnic strife between Turkey's Turks and Kurds. Tensions rose sharply last week as the government intensified air strikes against PKK strongholds in northern Iraq. The military said it also regularly staged cross-border land operations inside neighboring Iraq. In response, the PKK increased its attacks on troops and police officials, mostly through the use of improvised explosive devices. It killed nearly 30 officials in just two attacks, sparking civil strife. On Tuesday, thousands of demonstrators took to the streets in Ankara and other cities to condemn the PKK assaults in Turkey's predominantly eastern and southeastern provinces. The demonstrators targeted more than 100 buildings of a pro-Kurdish party and ransacked businesses they believed to be owned by Kurds. The party's headquarters in Ankara also was set afire. The military declared more than 100 designated military zones in the country's Kurdish areas. 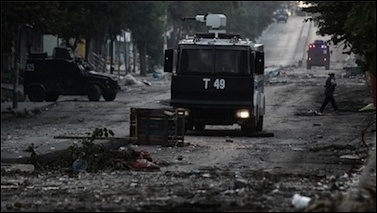 The government declared a curfew in Cizre, a Kurdish town. Before July 20, there was relative calm and only sporadic clashes since the PKK declared a unilateral cease-fire in 2013. The government was in indirect peace talks with the PKK to end the three decades of fighting that has claimed nearly 40,000 lives. President Recep Tayyip Erdogan has accused the PKK of secretly stockpiling bombs and weaponry during the cease-fire. "The top brass is obviously badly distracted by renewed fighting, the worst in the past several years," a senior military officer said. "No one wants to hear the words 'projects' or 'programs' or 'procurement' other than the urgent equipment needed to support the armed forces." One procurement official said that routine procurement meetings are generally continuing as scheduled, despite some cancellations. "The morale is very low. Even procurement meetings see discussions about the military side of the asymmetrical war we are now fighting," he observed. A senior Turkish industry source said, "We were politely warned [by the military] that this is no time to discuss programs or business." And the chief of the Ankara offices of a European company said, "We fear that things may go further out of control. This is not time to do business here." But an official from a US manufacturer was more cautious: "This is an awful spiral of violence. We expect to see relative calm after the elections." Turkey has scheduled new parliamentary elections on Nov. 1 because political parties failed to agree on formation of a coalition government following inconclusive poll results on June 7.